I have to admit I am not a big movie person, I might see one film a year in a movie theater. I do love picnicking and outdoor movies though. Each summer, I try to go to at least one Bryant Park movie in NYC, and I want to experience outdoor movies in other cities too. 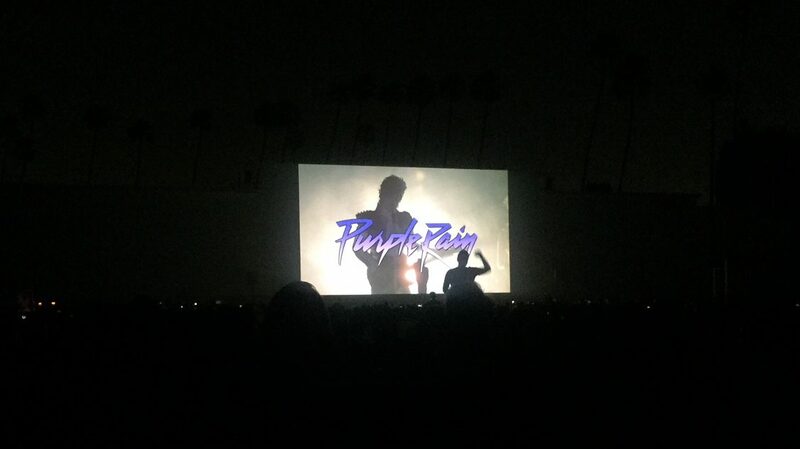 So when I was in LA, I was thrilled that Beverly, a friend of my friend Kat, had arranged for us to go to a Hollywood Forever Cemetery Movie Night to see a screening of Purple Rain. 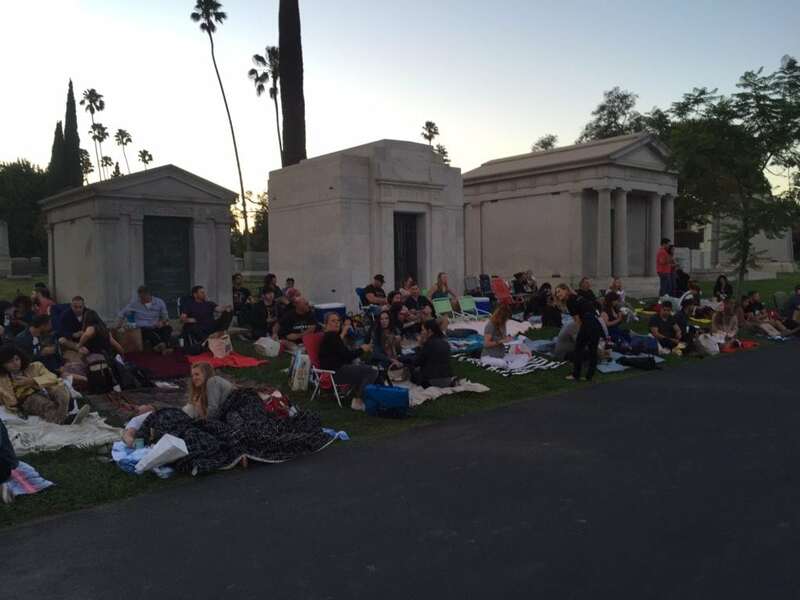 Yes, you can see a movie in a Hollywood cemetery! The movie night was one of a series of screenings that Cinespia puts on in the Hollywood Forever Cemetery each summer. You will need to get tickets in advance, as some movies at the cemetery sell out very quickly. Do not try to buy Cinespia tickets from a third party. They may not be valid and you will not be able to get a refund. If you plan on driving to the Hollywood Cemetery movies, you will need to also buy a parking pass. If parking passes are sold out, additional parking is available at the Hollywood Production Center Lot at 1149 N Gower and the Van Ness Lot at 900 N. Van Ness (entrance on Lemon Grove). You could also take an uber. Cinespia asks that you don’t park in the surrounding neighborhoods. Beverly rounded up a group of 12 of us to go, so we all met at her place to carpool to the Hollywood Cemetery. The traffic en route was lighter than we expected so we got there a little early, unfortunately, once we got there it was a bit of a mess to get in. We waited in the line of cars to enter the cemetery, but when we got to the front of the line they told us we were too early and would have to come back in 30 minutes. We waited in a nearby parking lot and then battled the traffic to get back in. They also made those that had parked offsite wait in a long line to get in. They were very strict about the opening time! There is no Hollywood Forever Cemetery parking lot, everyone just parked along the roads inside the cemetery. Once we parked, it was a short walk to the lawn where we would watch the film. We were a bit rushed because we wanted to make sure we got enough space for everyone, so I couldn’t explore the cemetery as much as I would have liked, but I was able to get a few pictures. The grounds were huge and the graves were more spread out than I have seen at other cemeteries. 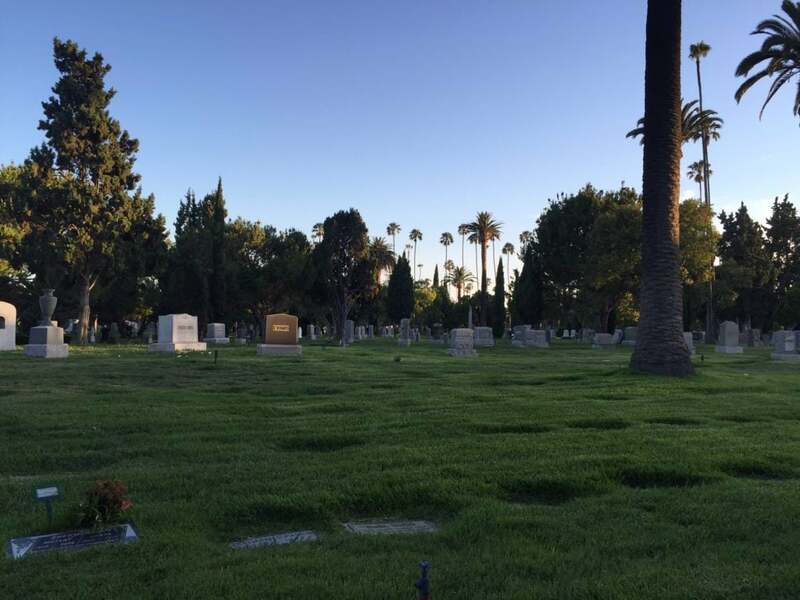 The Hollywood Forever Cemetery, originally called the Hollywood Cemetery, was founded in 1899 and more of Hollywood’s elite are buried here than anywhere else on earth. Some of the graves were crazy elaborate and others were typical of what you might see at other cemeteries. If you are visiting LA for the first time, here’s a list of other must-sees in Los Angeles. Everyone having a great time waiting for the sun to go down so the movie can start. We were able to get a spot just big enough for our group right behind one of the aisles that were marked across the lawn. This was key! It was very crowded, so this allowed us some breathing room and made it easier to get out if anyone needed the bathroom (port-o-potties only) during the movie. I was also wondering how close we would be sitting to graves. There weren’t any by us, but there were a few mausoleums towards the back of the lawn. One rule they were very strict on for the movies in Hollywood Cemetery was that chairs could not be higher than 6 inches off the ground. Luckily, my friend Kat had these backpack beach chairs that were perfect. It folds up and has straps so you can easily carry it on your back, plus it has space to pack other things that you might need for a day at the beach or picnicking. (Check here for availability and current price) Kat packed towels inside so that we could have blankets once the sun went down and it got cooler. There was also an area where chairs were not allowed. We weren’t sure what time the movie would start so we relaxed and enjoyed our picnic. Beverly brought a cute little picnic table (which I ordered for myself!) and we came prepared with lots of food and beverages. You can bring your own beer or wine, just no spirits. You could also just bring a picnic blanket, but in that case, you might want to also bring a tarp in case the lawn is wet. If you don’t have time to prepare, don’t worry they had plenty of food for sale – burgers, tacos, popcorn, and candy. We bought a bag of the kettle corn, which was delicious and tasted more like caramel corn to me. They also sell picnic blankets. While we were waiting for the movie, there was some fun music playing and the people watching was great. We saw a lot of people dressed up, plenty of purple, and even a few raspberry berets! The back section is by some mausoleums. Then when the sun had fully set and it was dark, it was about time to start the movie. Since we were in Hollywood, it was only fitting that the movie should be introduced by celebrities. The first celebrity to take the stage was DJ Questlove, who would also be the DJ for the Prince dance party that would start after the movie. Also one of the ladies who was in Prince’s band in the movie spoke for a bit. Then around 9:15, it was finally time for the movie. Purple Rain is the story of Prince during the beginning of his career and he stars in it. I have to admit I fell asleep during the movie. That does not say anything bad about the movie, it is not unusual for me to doze off during a film – remember I am not a movie person. And I was still jet-lagged and had been awake since about 4:30 am California time. I do want to try and watch it again at some point when I am not so tired. 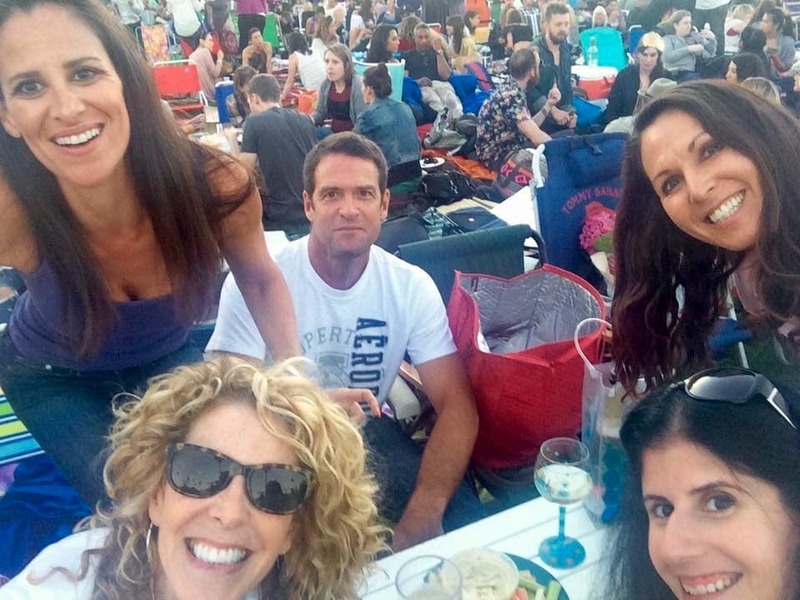 It was such a great atmosphere at the Hollywood Forever Cemetery Movie Night. Towards the end of the film, when Prince is performing the crowd got into it. During the slow songs, people were holding up their fake candles like we used to do with lighters back in the day. Then as the music got more lively, people started to stand up and dance. And then they added a great laser show! It was a smooth transition from Hollywood movie night right into the Prince dance party. 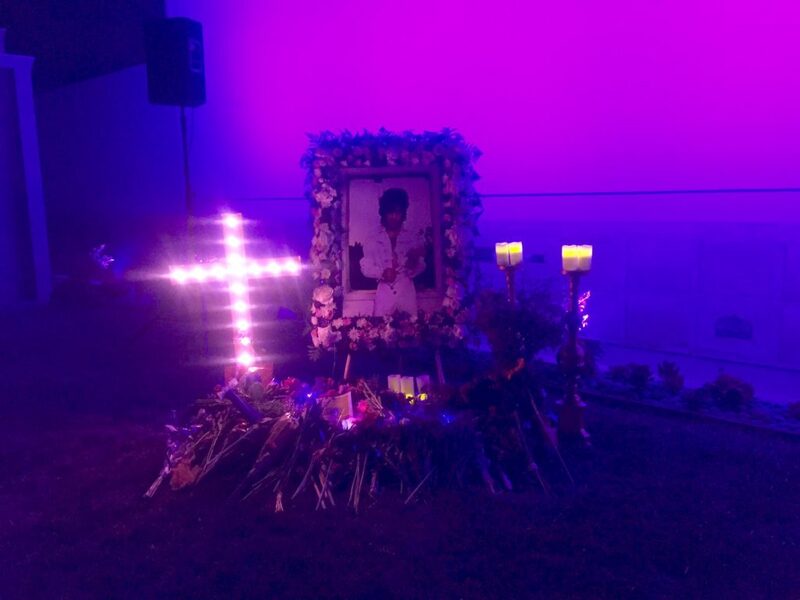 In addition to the movie, they also had a Prince-inspired photo booth (lots of smoke) and a memorial. The line for the photo booth was pretty long so we didn’t get to try it. We did visit the memorial and it was touching to see people had brought flowers to place beside it. Cinespia tickets sell out quickly. 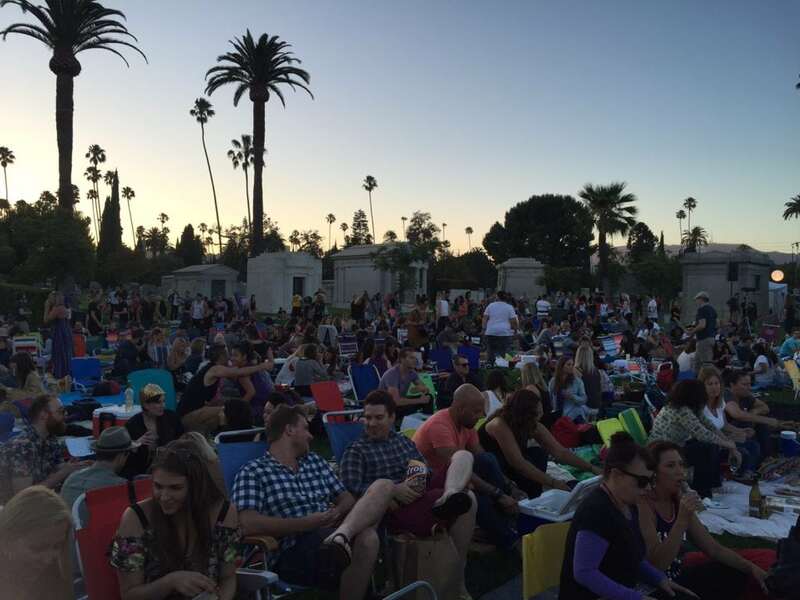 Buy your tickets for the Hollywood Forever Cemetery movies (and parking passes) early! Try to get a space by the aisle so that you have some breathing room and can get out easily. Bring chairs (no higher than 6 inches from the ground) or try to sit in the no chairs section. If you are interested in learning more, consider taking a Hollywood Cemetery tour like this one. This looks amazing! Outdoor cinema evenings are becoming more popular in England but not held in cemeteries. Do they hold a halloween special – bet that would be super spooky? Yes, I have heard about the ones in London, which I would love to do. Unfortunately, I think the outdoor movies are only in the summer although I agree with you a Halloween one would be fun! Angela – It actually wasn’t creepy at all surprisingly. I think you would enjoy it! I love outdoor cinemas–in fact, it’s the only way I really like “going to the movies”–but this is WEIRD. I’ve never heard of such a thing. Did you sort of forget you were in a cemetery or was it always in the back of your mind? Emily – It was kind of like I forgot I was at a cemetery. I think it was because there were some many people, it didn’t feel weird? This is such a cool idea! I wish outdoor movies were more of a thing in Korea.. the closest we get is once a year at Busan International Film Festival they have an outdoor screening area for some of the movies. Though to be fair, living where BIFF is held is pretty awesome. Looks like you guys had a lot of run, and the movie transitioning into a Prince dance party is an excellent way to end the night. Alice – Yes it was a great night! BIFF sounds like a lot of fun, too bad its only one week a year. Thanks Naomi! It was a lot of fun! Fascinating! 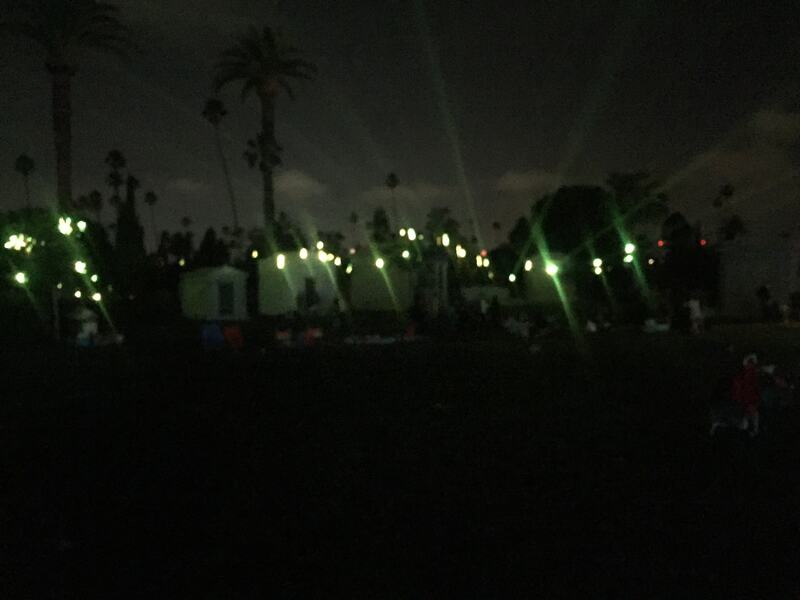 I had no idea movies in the cemetery was a thing. I definitely prefer the environment of outdoor movies, be it old-fashioned drive-ins or movies in the park, but would have never thought about a cemetery. Cool concept! Thanks Melissa. I hadn’t heard of it before either. It was definitely a unique experience! I wish there were more drive-in movies around. I have never heard of this cemetery which is ridiculous because I am a huge fan of classic movies. I love the idea of outdoor movies but I’ve never been to one where I could hear the movie. It’s always more of a social experience than anything else. So don’t feel bad about falling asleep. 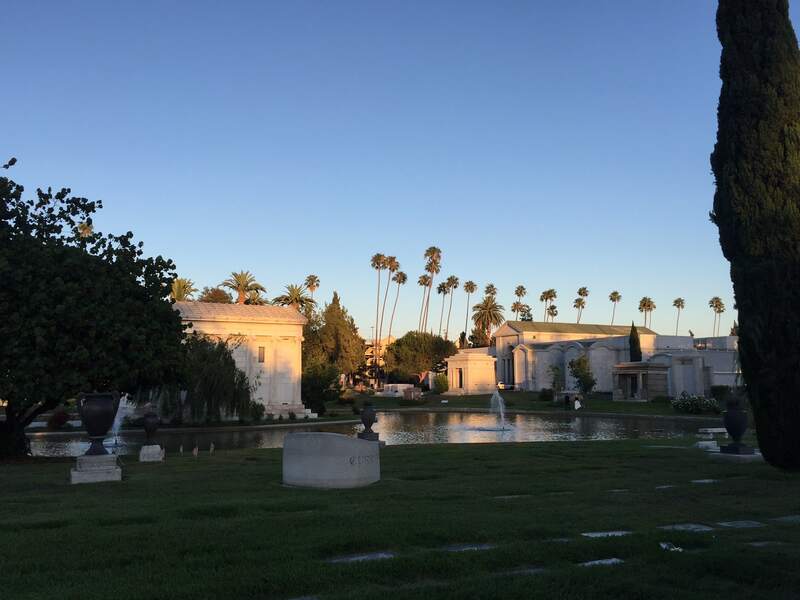 Stella – Next time you’re in LA you should definitely visit the cemetery. I agree that sometimes it is hard to hear outdoor movies, but this one (at least from where we were sitting) it wasn’t an issue. Lolo yes, I think you would enjoy it. I think in is only during the summer though. I am a big movie person! I went to three this week! (not a regular thing, just stars aligning). I can see both sides to the movies in Cemetery argument – we have one here and people get all out of joint over it being disrespectful. Which in one way I can see, but then I also think the dead don’t mind and might even enjoy the influx of visitors. I’ve still not been but only because I’m already doing something, rather than in protest. Lydia – You should check it out if you can. I agree it would be disrespectful if people were picnicking on top of peoples graves but that is definitely not the case. Wow! What a fun experience! I’m not one for graveyard anythings, let alone movies, but from your pictures it’s really hard to tell that it’s a cemetery at all. Everyone looks like they’re having so much fun, and the fact that it was a tribute to Prince (from our state!) is even better. 🙂 Did you stay for the dance party? Anna – It was a lot of fun! We did stay for the dance party not only because we thought it would be fun (it was) but also to wait out the traffic leaving! This is something very different and I certainly would like to try. Maybe it will catch on. Looks like lots of fun! Thanks Barry. It is pretty popular in Hollywood, will be interesting to see if other places start doing something similar. Alright! Well this just might be the most unusual site for an outdoor movie event that I have ever heard of. Arnie – Yes it was different from any other outdoor movie I have gone to! I would definitely recommend it though. Thanks! It was fun! So where do they do outdoor screenings in Sydney? Wow, never heard of this before. Looks like fun especially if you go with a group. Lisa – I hadn’t heard of it either! It was a lot of fun, I would definitely recommend it. Unlike you, I have movies for breakfast, lunch and dinner (so to speak). I see at least 5 movies a week but I go to movie theaters only when there is something really worth watching. But although I live in L.A., I had no idea about this movie ‘venue’. A cemetery? Ha,ha,ha, quite ingenious I have to say. I’m sure it was a lot of fun. Anda – You will have to check it out and let me know what you think! I have never been to one of these outdoors cinemas. There are so many around Los Angeles and even in the city were I live. I have to make a point to visit. One of my friends went to see Coming to America in the San Fernando Valley. That is a good oldie (I remember how much I used to like that movie when I was a kid). Ruth – I loved Coming to America too! I hope you can make it to one of the outdoor movies soon, they are a lot of fun. So interesting, thank you for sharing! I didn’t even know they showed movies there but I’ll have to add it to my bucket list! Katie – You are welcome! Yes it is definitely a unique experience that is bucket list worthy. I’m sure you will enjoy it. Rob – Glad to hear you enjoyed it as well! This is right up our street, been to a couple of outdoor cinemas, one in England and Greece, so much nicer in warmer countries! Thanks for sharing – have bookmarked in my LA folder for next time we visit! Garth – Glad you enjoyed it. I agree I prefer warm weather too. I have heard about ones in London close to Embankment, which I would love to go to sometime! Marcelle – It is unusual but it really wasn’t scary. You almost forget you are in a cemetery. I’ve been in the area a lot before, but I’ve never thought about checking out this famous cemetery. Great post! I’ll have to check it out next time. I bet everyone was very happy to be there and pay their respects to Prince via Purple Rain. Jaye – So glad you enjoyed it. We had a lot of fun. Hope next time you are in the area you can check it out.